Two top-of-the-line drum kits were thoroughly recorded: a Drum Workshop Collector’s Series from the mid 90s as well as a Pearl Reference kit from the mid 00s. Drum Workshop (DW) are well known for their exceptionally high standards and innovative direction in the art of making drums. This maple Collector’s Series kit recorded in Studio Two, which we call the 'White Kit', is the best from this flagship line of custom made American drums. Pearl is a name synonymous with rock & roll since the 60s. The Reference kit recorded in Studio Three, otherwise known as the 'Sparkle Kit', debuted on the market in 2005 and is still the highest quality commercially available kit in Pearl’s current range. Every care has been made to ensure the most accurate recordings possible, preserving the true character of the original drums. The DW kit was tuned with a slightly ‘rockier’ sound in mind than the more ‘poppy’ sounding Pearl kit, but remember there are no rules! 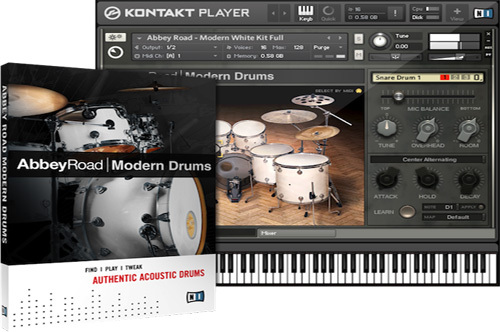 Utilizes both contemporary and vintage high-end recording equipment to achieve ultimate sound quality across all individual instruments of the kits. Over 40,000 samples, 24-bit, 44.1 kHz. Up to 27 velocity layers for a single articulation. Up to 6 variations of drum hits at the same velocity for added realism. Additional compressed Mono Overhead and Mono Room samples for additional sound possibilities. Three snare options for each kit. Separate Right and Left hand samples for the most common Snare, Tom, and Hihat articulations. Snare Top/Bottom and Kick In/Out samples. Optional snare bleed samples for many drums. Highly functional user interface offers convenient control over all articulation, sound shaping, mixing and routing functions. Advanced randomization can even add subtle nuances to the tone and timing to make it virtually indistinguishable from a studio-recorded drum performance.